…..is a Straight forward, confidence giving course!! 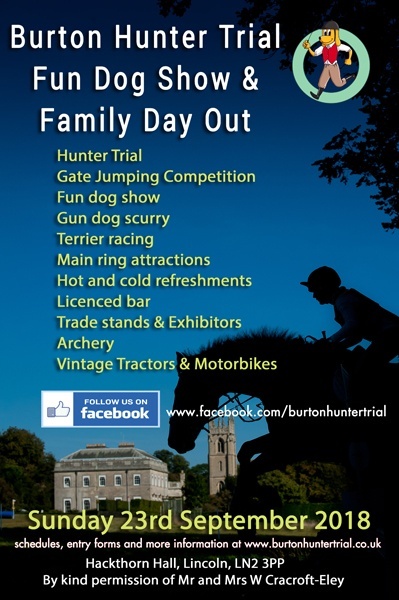 This years Burton Hunter Trial will take place on Sunday 23rd September 2018. This years event will once again take place at Hackthorn Hall by kind permission of Mr & Mrs Cracroft-Eley. Following the feedback we received from our online survey after last years event, we have listened and made some important changes. The timed section has been changed to improve the rate that riders can get through this section and some of the skinny fences have been removed. Our course designer has also made some improvements to the course and has moved one troublesome fence along with some other minor changes. We hope these changes will make you enjoy your day even more. In every class, there will be a Joker Fence. This will be a knock-down fence that WILL be higher than the other fences on course. It is completely optional and if you clear this jump successfully on the first attempt, you will save 3 seconds in the time section. Please keep a close watch on this web site for entry details. In our main ring, which is situated on the higher ground surrounded by trade stands, refreshments and sponsors hospitality, we are running a Gate Jumping Competition with a cash price for the winners. This year we will be running two classes in the gate jumping. The first class will be for horses that have not jumped over 110cm unaffiliated and the second class will be those who have jumped over 110cm affiliated.